Jowar, also known as white millet has been popular among humankind since ancient times. 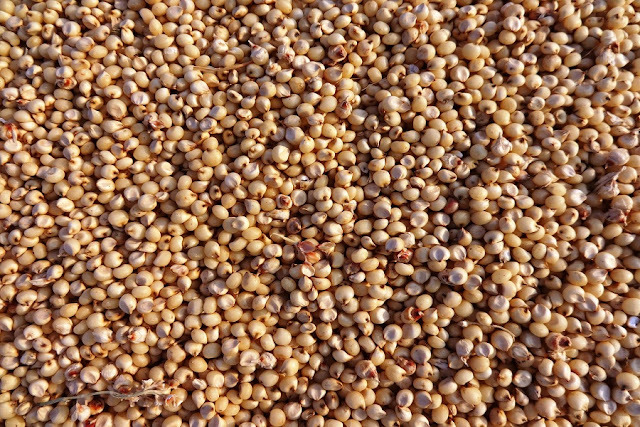 It is a cereal grain widely known as Millet Sorghum. These cereal grains contain 70 percent carbohydrates, 12 percent protein, along with 3 percent fat and low Vitamin Content. It also offers an economic and excellent nutritive value. Jowar, if grown organically, offer uncountable health benefits. These gluten free millets are also loaded with high amount of fibers which helps in losing weight. The most amazing thing about white Millets is that it can easily be consumed by making several healthy and delicious recipes. Rich in antioxidants, Jowar is known for its high nutrient value that protects your heart from several cardiovascular diseases. It also contains essential minerals and vitamins like Vitamin E and B, Iron, as well as magnesium. Its ability to prevent the clumping of platelets also reduces the risk of getting strokes and heart attacks. As we all know Jowar is gluten free millets which are loaded with high amount of fiber. It keeps your stomach full and helps in maintaining the proper functioning of the digestive tract. White millet is also great for lowering the risk of obesity, stroke etc. It also helps you control your hunger pangs which in turn help you lose weight effectively. Free radicals are really harmful for our bodies as it causes several health conditions like cancer, boost ageing, heart diseases, and much more. But Jowar contains a compound called Anthocyanins, which prevent the occurrence of free radicals, which in turn maintains the cholesterol level in the body. Jowar is also a rich source of antioxidants and phenolic content that helps in regulating insulin and glucose level in the body. Regular consumption of Jowar is also great for people suffering from diabetes. Jowar is definitely one of the best foods to consume, which helps in boosting immunity naturally. It contains many essential minerals and vitamins like magnesium, calcium, and copper that offers stronger bones and tissues as well as boost your energy levels. White Millets or Jowar is the natural source of protein, fiber, calcium, magnesium, proteins and phytochemicals, which offers you balanced diet as well as helps in balancing blood sugar level in the body. The bran layer of Jowar contains many cancer-fighting antioxidants that are vital for the body. Some of these antioxidants are only found in this cereal and thus, Jowar becomes an effective anti-carcinogenic. Frequent consumption of Jowar also helps in reducing the risk of Cancer like colon cancer, breast cancer, digestive tract cancer, abdominal cancer as well as breast cancer. Jowar is also beneficial for people seeking rid of hypertension. Constipation is one of the most common problems faced by individuals nowadays. To treat the problem naturally, you must consume Jowar in order to treat the digestive problems like constipation, hemorrhoids, Diverticular disease as well as infrequent bowel movements. Jowar is loaded with a good amount of dietary fiber which helps in improving digestion. This Dietary fiber present in it works to add bulk to the stool and helps it pass smoothly through the digestive tract. Quite a few people know this,Jowar is free from gluten, which helps in preventing Celiac disease. It is, in fact, a boon to all those people suffering from gluten sensitivity. Phosphorus is one of the most essential nutrient required by our body that helps in the growth and maintenance of the bones as well. Jowar also contains a rich amount of Calcium as well, which helps our body by strengthening bones. Magnesium is one of the major constituent of Jowar. The presence of magnesium increase the level of calcium absorption that is helpful in maintaining calcium level. It further helps in promoting bone health. Jowar contains a compound called Niacin also known as Vitamin B3, that helps our body to convert the food we eat into the energy, which in turn boost the metabolism and help the body to function properly. Jowar is one of the best remedies to prevent the risk of Melanoma, which is a special type of skin cancer. These cereals contain many cancer killing antioxidants that does not only treat cancer, but also kills the bacterias that possess the ability to cause cancer. Being overloaded with mineral, iron, and copper, Jowar is one of the best foods that improves blood circulation. Increase in iron level leads to better oxidization in the body that leads to improved oxidization of muscles, organs, tissues, and various other organs in the body. Jowar contains phosphorus that is quite helpful in promoting cellular growth and repair of bones. It contains essential nutrients that play a vital role in building the cell membrane DNA, RNA and phospholipids. As we all know Jowar is rich in nutritional value and the health benefits that it offers to our body cannot be ignored. If taken regularly, Jowar can be your best source of nutrients. It is also a good source of Vitamin B like Niacin, Thiamin, and Riboflavin. It has also a high level magnesium, copper, iron, calcium, potassium and phosphorus. It has more antioxidants as compared to Pomegranates and Blueberries. In this era, people are quite concerned about their health. Dietary supplements and fitness capsules have become a part and parcel of life for many of us. But, these supplement sources can never compete with the health benefits of natural food like Jowar. It is interesting to know that Jowar is the fifth most grown grain crop in the world after rice, wheat, barley and corn. But many a times this delicious and gluten free grain is overlooked in western countries. Jowar comes with a plethora of health benefits that makes it a must include food items in the diet. More than 30 different species of Jowar are found in the tropical and subtropical regions of the world. Believe it or not, Jowar is truly a blessing for human that offers a considerable amount of nutrition and improve your overall health.